Record breaking forward Kenneth Faried is not the most skilled player on this list, but his situational breakdown is indicative of the fact that he may be the hardest working. Shooting a third ranked 61.2% in half court situations, Faried was a dominant figure in the OVC, and showed well against top competition too. He earned a top-ranked 23% of his possessions on the offensive glass, converting 70.2% of the put-backs (2nd). Despite his relentless hustle, Faried actually saw the majority of his touches in one-on-one situations in the post (40%). Shooting 52.4% in those situations (4th), Faried's aggressiveness and toughness made him an imposing offensive presence at the college level despite his lack of advanced scoring-moves. Faried's best asset is his finishing ability. He scored 1.484 points per-possession at the basket last season an incredible mark and the best among big men. Faried isn't much of a jump shooter at this point, but it is hard not to be impressed with the way his motor and athleticism manifest themselves in the paint on paper. Kenneth Faried saved his best for last, but did Morehead State's upset of Louisville change his NBA outlook? Demonte Harper provided the last second heroics as Morehead State toppled Louisville in the first round of the NCAA Tournament a little under a week ago, but it was Faried who denied the Cardinal's last second shot and carried his team as he so regularly has throughout his four year career as an Eagle. Tallying 17 rebounds in that game, and 13 in Morehead's subsequent loss to Richmond in the round of 32, Faried did the same thing he's done his entire career: hustle, play with toughness, and pursue absolutely every loose ball on both ends. Though Faried has collected many of his NCAA modern-era record 1673 rebounds against less than elite competition in the OVC, his performance against Louisville was one of a number of eye-opening outings he's turned in against top competition. Going for 20 and 18 at Florida and 15 and 12 versus Ohio State back in November amongst a handful of other double-doubles against top-25 teams in previous years, Faried has proven that he can get the job done against comparably talented prospects. The question is where that places him heading into the 2011 NBA Draft. Looking at the top rebounders in our database over the past decade, it is clear that being an elite NCAA rebounder does not guarantee a NBA career. Amongst the top 100 collegiate rebounders in the past nine years, 34 prospects have made it to the NBA. Five of those 34 signed as undrafted free agents, nine were selected in the second round and 20 garnered a guaranteed contact as first round picks. Considering the track record of prolific rebounds over the last decade, the other aspects of Faried's game become that much more important to his immediate success. On the offensive end, the long, athletic big man has a fairly cut and dry game. He excels in situations where his energy level factors into the equation, but doesn't show a very polished skill set. Ranking in the top 3% of all college players in terms of points per-possession in finishing situations at 1.484 PPP, according to Synergy Sports Technology, Faried's terrific length and explosiveness make him extremely effective around the rim. Showing excellent quickness filling lanes and getting out in transition, he can create second chance opportunities for himself by remaining active on the offensive glass. With his back to the basket, Faried remains heavily reliant on his right hand and prefers to operate over his left shoulder, flashing a very basic post repertoire that he'll likely struggle to translate against better competition. Despite his predictability, Faried saw nearly 40% of his offensive possession in the post according to Synergy Sports Technology. He converted 52.4% of those shots this season thanks in large part to the work he does before he receives the ball. Getting in an extremely low stance and working to seal his man before an entry pass is made, Faried doesn't show many counter moves, is limited with his left hand, shows average touch, and is at his best when simply able to take one dribble and elevate. When Faried has been met with double-teams this season, he's been fairly erratic, as we saw on a few occasions in the NCAA Tournament. A capable passer when he can identify the second defender early, he proves turnover prone when he doesn't have his head up to see the rotation at the catch. Fortunately, his lack of back-to-the-basket polish will likely preclude him from facing such pressure on the NBA level. Perhaps the most glaring hole in his game at this point, Faried has no midrange or floor game to speak of. He attempted just 13 jump shots this season according to Synergy Sports Technology and only knocked down 57.7% of his attempts from the charity stripe. He does spend quite a bit of time setting screens out on the perimeter, but doesn't look to score the ball on the few occasions he does touch the ball away the paint, unless he has a clear lane. The fact that he doesn't really need to be guarded outside of the three second area will make it difficult to integrate him into certain offensive schemes, and will surely hurt his team's overall spacing. Essentially functioning as a center for the Eagles offensively, Faried was not a dominant offensive threat in the NCAA and will inevitably see his role diminish in the NBA on that end of the floor. His lack of polish down low and inability to step away from the rim makes him best-suited playing a simple catch-and-finish type role, which he does appear quite capable of filling. Unfortunately this may preclude him from seeing heavy minutes in offenses where the power forward is expected to do a bit more than that with the ball in his hands, which likely relegates him to being a backup on most teams. Defensively, Faried posts good numbers thanks to his tremendous length and quick leaping ability, but is fairly difficult to evaluate on the college level. Sitting in the middle of Morehead's 2-3 zone, he is virtually never asked to step out and defend the perimeter, essentially serving as a last line of defense at the rim while his teammates scramble to close out shooters something Richmond exploited by position Dan Geriot just above the free throw line while spreading the floor with shooters. Though Faried's ability to sit by the rim allows him to maximize his presence as a shot blocker and rebounder while helping his team overcome its lack of size, it doesn't offer much insight to his ability to defend one-on-one in the NBA. When Faried does find himself in a pseudo-isolation situation in the post defensively, he struggles to hold position as the video above indicates. Clearly lacking some bulk, particularly in the lower body, he'll need to continue adding weight to his frame so he can deal with rigors of the NBA. Though he'll deflect an entry pass and come up with a steal from time to time at the college, he'll get sealed out of the play entirely almost as often, and will make some questionable reads defending off the ball. That niche may be as a competent defender away from the rim. Faried has all the tools athletically to be effective against the type of stretch fours that are en vogue in the NBA at this juncture, but NBA decision-makers will take pause in jumping to that conclusion until they can see him prove his mettle in a true man-to-man defensive setting. Considering his lack of experience in such situations, he will likely need some coaching in this area. Slightly undersized, limited offensively, and inexperienced defensively, Faried has a fair share of question marks. However, he has a clear NBA-level skill, and the type of motor coaches dream of, which can't be said for every prospect. Expecting him to come in and emerge as a major impact player early in his career is a stretch, but Faried certainly seems to have the tools to fill a Louis Amundson-type role for a team looking for a workhorse to infuse their team with energy off the bench. If he works on his weaknesses and adapts to the professional game, Faried could live up to the lofty expectations he's set for himself with his outstanding college career. Jonathan Givony conducts an in-depth conversation with the #1 rebounder in college basketball, Morehead State's Kenneth Faried. -His background and why the New Jersey native was not recruited by schools in the Big East. -The early-entry deadline and how he plans on conducting NBA workouts in the shortened window imposed by the NCAA. -How many workouts he'll be able to squeeze in between classes between April 29th and May 8th. -His status as an early-entry prospect. -The potential conflict of interest involved in having his head coach run the NBA draft process for him and the trust he must have in him. -His mother's health and what effect that might have on his decision to stay in the NBA draft. -Why any type of guaranteed contract offer from an NBA team would be enough for him to stay in the draft. -What his historic rebounding statistics should tell NBA teams about the type of player he is. -The art of rebounding, what makes a great rebounder and what kind of influence his background had on the type of player he is today. -His perimeter skills and how he fits in on an NBA team. -Will he have to play small forward in the NBA to be successful. -The Ohio Valley Conference as a one-bid conference and how difficult it was not to make the NCAA tournament this season. -The lack of attention he receives playing in the OVC and whether he's being overlooked by NBA teams and the mainstream media. Posting very similar numbers to what he did as a sophomore, Kenneth Faried has just concluded another extremely productive season at Morehead State, leading the country in rebounds per 40 minutes pace adjusted. Faried also slightly increased his scoring output this season, continuing to show brief flashes of offensive development. Physically, theres not much new to say about Faried, an extremely explosive and reactive athlete who runs the floor like a deer and finishes very well around the rim. The majority of his scoring contributions come from his excellent ability to catch the ball in mid air and dunk it, either in transition, on alley-oops, cuts through the lane, or just getting open around the rim. He has excellent hands and the hand-eye coordination to go with it, catching and finishing virtually everything thrown his way. The other area Faried provides strong contributions on the offensive end is with his unbelievable rebounding ability, as he shows excellent timing, positioning, and leaping ability in that regard. His motor is non-stop both in regards to rebounding and getting open without the ball, constantly moving, reading the defense, and trying to post up his man. In terms of creating his own offense, Faried is still very raw, showing flashes of post-up and face-up ability at times, but nothing really at an NBA level. Facing up, he can put the ball on the floor for one or two dribbles in a straight line, where he has a good first step and rangy strides for a power forward, but cant really do much else with it, not really having any change of direction ability with the ball. Hes not a very good handler in the open floor either, lacking fluidity and comfort with the ball moving at such a high speed. In the post, Faried is incredibly reliant on turning left shoulder, strongly favoring his right hand and a right-handed hook shot in particular. He finishes decently well in the post at this level, but thats mainly going against undersized fours in mid-major play, and its hard to project any of that translating to the next level should he remain a frontcourt player. The biggest thing Faried could stand to work on offensively is developing his mid-range jumper, as he rarely puts up jump shots at all, and when he does, its often with very poor results. Considering the rate he gets to the free-throw line, thats even more reason for him to develop his jumper, as he could add more offensive value to a team if he was finishing at a rate higher than 58% from the line. Hes also a very poor passer statistically, garnering an assist on just 4% of his possessions, which is amongst the worst rates in college basketball at his position. That might have something to do with his role on Morehead State, though, as its unlikely that any NBA team would rely on him anywhere near as heavily on him offensively as his college team currently does. Defensively, there are serious concerns about what NBA position Faried is going to play, as he plays almost exclusively at the center position in Morehead States 3-2 zone, virtually never allowing him to venture onto the perimeter and get into a perimeter stance. Given his athletic abilities, its not outlandish to think he could develop the lateral quickness to match against 3s in the NBA, and thats certainly something NBA teams will want to evaluate in private workouts, because at 68 with a narrow frame, Faried doesnt project as a great defender at the 4 position. Even in college, he is constantly pushed off the block by stronger players, struggling to maintain post position, forcing him to overplay entry passes in the paint to try and steal the ball, leading to some easy scores. As a help defender, Faried uses his length well both in the passing lanes and in the paint, blocking and stealing a decent amount of shots, though he doesnt project as a big-time shot blocker in the pros by any stretch. Looking forward, Faried probably isnt going to develop a ton more as a senior, and spending another year playing the 5 position in a 3-2 zone in a low-major conference, giving him no opportunities to improve his perimeter defense, probably isnt going to help his pro prospects much, seeing how that is the biggest question mark in translating his game to the NBA. Missing out on an NCAA tournament appearance (his team was defeated in the championship game of Ohio Valley conference tournament by a very good Murray State team) does hurt him a bit, as he could have used the exposure of a high-profile matchup to prove that he can compete against the elite teams in college basketball. 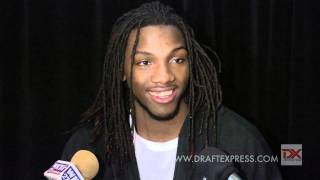 Featuring some of the most eye popping numbers in college basketball and a style of play that is bound to endear him to NBA scouts, Kenneth Faried has been overdue for a mention on this site for quite some time now. Only a junior, and a young one at that, Farieds per-minute production has jumped off the page since the moment he stepped foot on an NCAA court. Not particularly big at around 6-8, and showing a narrow frame that could definitely use some extra bulk, Farieds physical attributes dont overwhelm you on first glance. Hes a good athletequick, reactive, agile and showing a terrific second bouncebut its his intensity and aggressiveness that makes him the player he is. Faried is the top-returning rebounder in college basketball, grabbing an outrageous 17.1 rebounds per-40 minutes pace adjusted, which ranked right below DeJuan Blair last season. He displays all of the characteristics that most of the great rebounders doshowing outstanding hands, instincts, timing and reflexes pursuing loose balls ferociously, relishing contact and not having any problem sacrificing his body to help his team come up with an extra possession. Offensively, Faried has made big strides over the past few years, but still projects as a role-player at best against higher level competition. He does an excellent job finishing around the basket thanks to his toughness, aggressiveness and solid explosiveness, usually finishing above the rim in emphatic fashion. His face-up game has improved quite a bit, being capable of taking his man off the dribble with nice footwork and hitting a decent amount of mid-range jumpers last season. While certainly prone to trying to do too much at times (leading to some questionable shots and turnovers), Faried appears to have an above average basketball IQ, being a solid passer who seems to understand the game fairly well. He gets to the free throw line at a terrific rate, but only converts 58% of his attempts once there. On the downside, Farieds skill-level is not extraordinarily high, as most of his production still comes from sheer will and tenacity. His ball-handling skills are improvable, his jump-shot still way too streaky, and his post game underdeveloped. Faried will need to continue to bulk up and polish his all-around skill-set if hes to prove to scouts that his OVC numbers can translate to a much higher level of competition than hes accustomed to. Defensively, Faried is somewhat of a mixed bag. If projected as a power forward at the next level, he could have all kinds of issues guarding some of the more traditional big men hell find in the NBA, as he lacks both size and strength. Its doubtful that he has any experience at all guarding perimeter players, though, as he spends most of his time at the 5-spot for Morehead State. On the other hand, you cant teach the type of hustle and aggressiveness that Faried brings to the table, and you surely cant ignore his propensity for making big plays on the defensive end. Beyond his rebounding skills, he does a terrific job at getting steals and blocks, averaging 2.5 per-40 pace adjusted in both categories. Players with comparable characteristics, such as DeMarre Carroll and Renaldo Balkman, were drafted in the first round regardless of their tweener status, and Faried could make a similar case. The NBA has shied away less and less as of late from players with less than ideal physical attributes, granted they can bring a team something extra in the toughness and activity level category. Faried will likely get his fair share of looks from teams this season, and still has another year of NCAA eligibility at his disposal if he doesnt like what hes hearing about his draft stock this spring.